2) Angry Orchard (New York) and E.Z. Orchards (Oregon) launch Understood in Motion 02, New Bi-Coastal American Cider. 3) Wine Enthusiast recommends Exploring Europe’s Cider Trail. Of related interest: Cider is (or can be, or should be) wine is an excellent essay by Andreas Sundgren Graniti of Sweden’s Brännland Cider. 4) The French Connection finds The Ciderologist visiting Christian Drouin, Manoir de Grandouet, Le Père Jules, and Domaine Dupont in Normandy. 5) The Meaning of Farmhouse Cider has four US cidermakers sharing their opinions with Emily Hutto at Cidercraft. 6) Barrels Are Magic is Ron Sansone’s interview with Seth Boeve of Virtue Cider for Cider Culture. 7) Portland Cider Company in Oregon, Western Cider in Montana, and Swilled Dog Hard Cider in West Virginia announce community apple drives. 8) CiderScene makes it A Cider Day In Minneapolis. And at Cider Culture, Shawndra Russell writes on Drinking Cider in Hendersonville, North Carolina and Samantha Story posts Broad Street Ciders & Ales: Now Open in New Orleans. 9) Events this weekend: Woodchuck’s Ciderstock in Middlebury, Vermont; the Sausage and Cider Fest in Covington, Washington; the Worcester CAMRA Beer, Cider & Perry Festival in Worcestershire; and the closing of the Apfelweinfestival in Frankfurt. 10) Cider Says attends the Washington Cider Week Preview Event, previews Cider Summit Seattle, and reviews Grizzly Ciderworks The Bruin Dark & Dry Hopped. Cidercraft reviews Angry Orchard First Flora 2015. 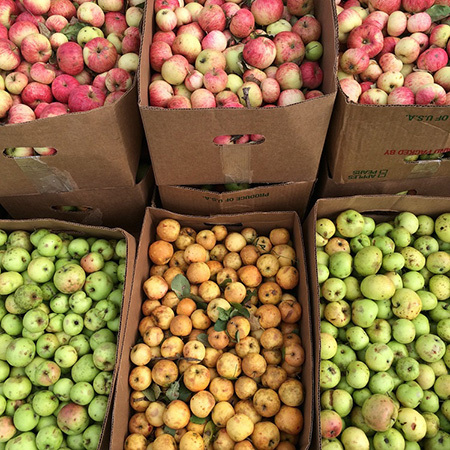 The Milled Apple reviews Flag Hill Farm Sapsucker and Prospect Ciderworks Sidro. Cider Society reviews Graft Cider Book of Nomad: Orion’s Cryptogram, Stormalong Boston Heirloom, and Argus Fermentables Apple Bomb. The Cider Crate reviews Calvados Boulard Pays d’Auge. The Cider Drinker reviews Gibbet Oak / Nightingale Falstaff & Bramley and Blind Pig Bourbon & Blueberry. Cider Explorer reviews Longueville House Cider, Cider Bohemia Cannabis Cider, and Bignose & Beardy Cockhaisy. And Real Cider Reviews tries Bilpin Archibald Extra Brut.